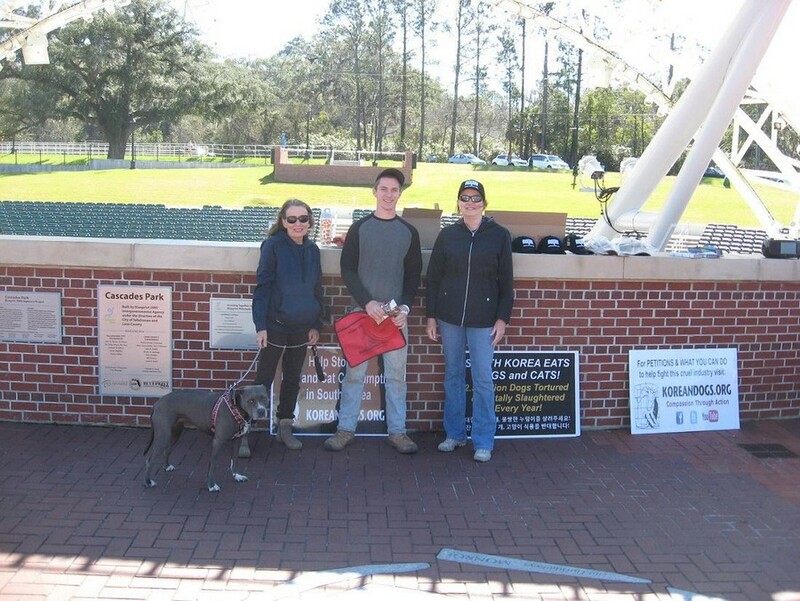 We passed out leaflets and gave away promotional items at Cascades Park in Tallahassee, Florida on February 21, 2015 in an effort to raise awareness about the torture and consumption of dogs and cats in the meat trade. 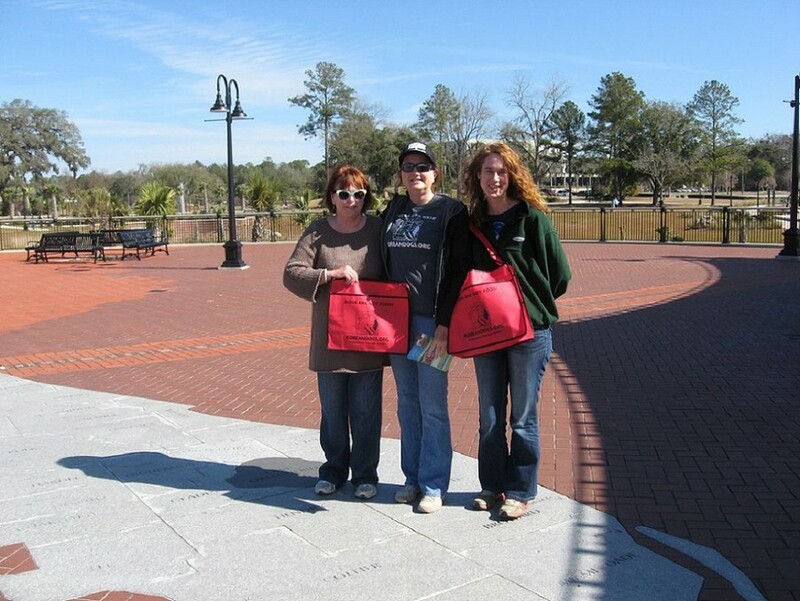 We gave away about 50 Frisbees, 25 hats, 20 tote bags,and 25 key tabs. 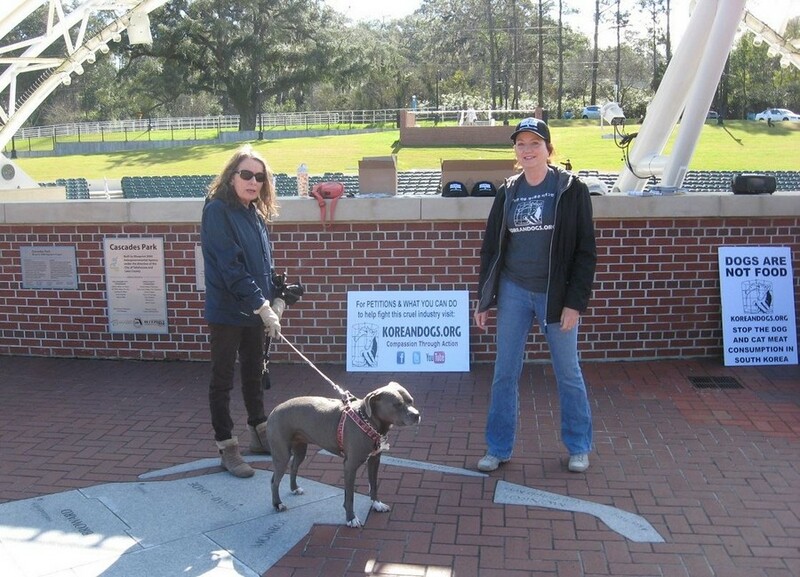 Thank you, Sally for speaking out against the horrible cruelty of the South Korean dog meat trade! Sally is Mayday Parade‘s lead singer Derek’s mom and a dedicated animal rights activist. We are honored to have her supporting our campaign and thankful for her compassion for the South Korean dogs and cats. 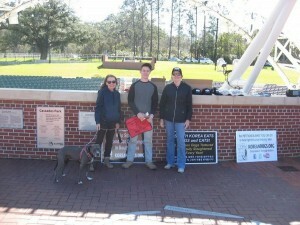 Our KoreanDogs.org advocates, Becky, Pippa, and Sally at Tallahassee’s Cascades Park. 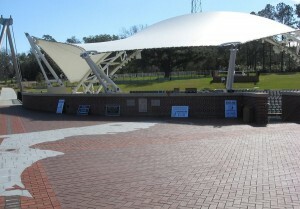 Behind the Amphitheatre is a large representation of the state of Florida with all the counties outlined. 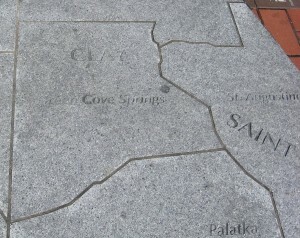 I am standing on Pasco County. 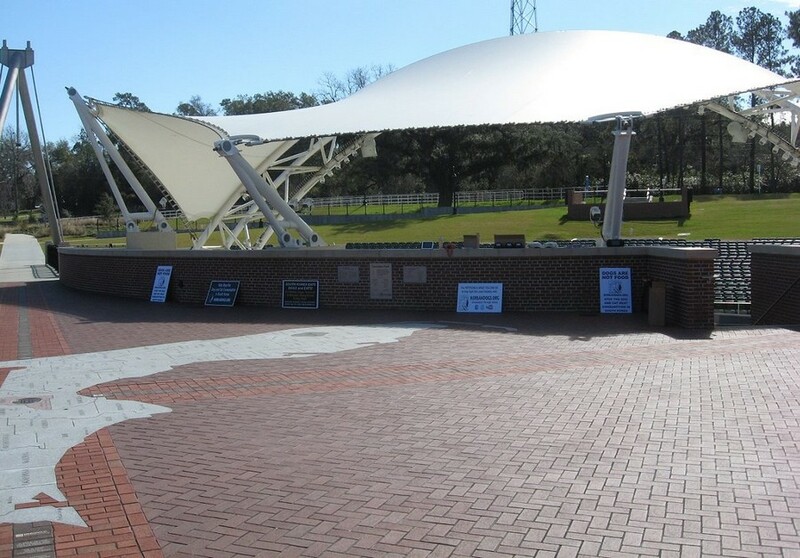 We set up our signs and free promotional items behind the Capital City Amphitheatre. 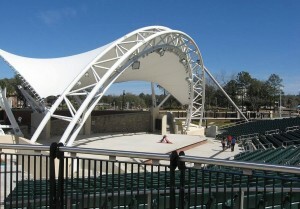 The Capital City Amphitheatre seats 3,500. 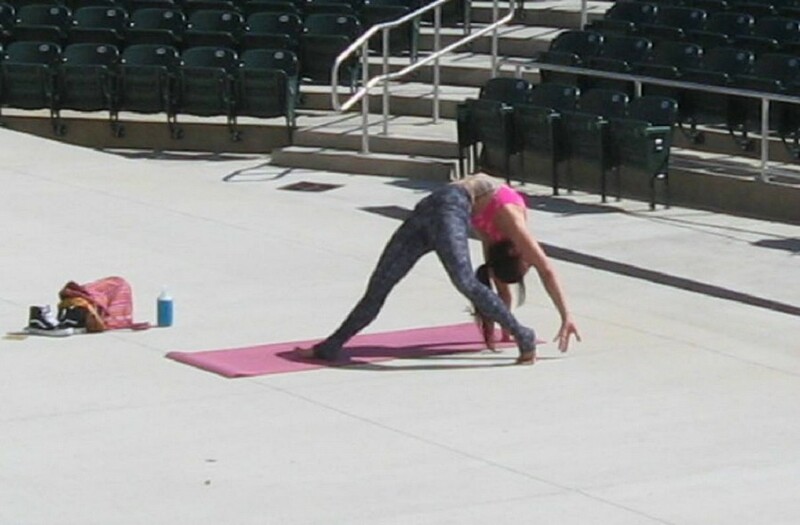 This limber woman did yoga exercises on center stage for almost the entire two hours that we were there. This smiling young man helped us recover signs that blew away. We were glad to reward him with free items. 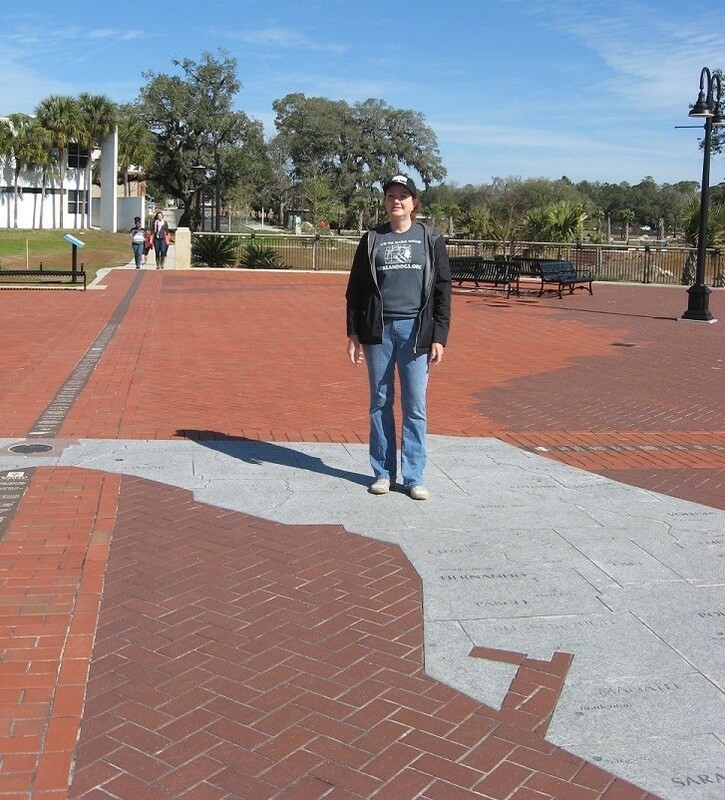 I think Sally is standing on Alachua County. How appropriate. 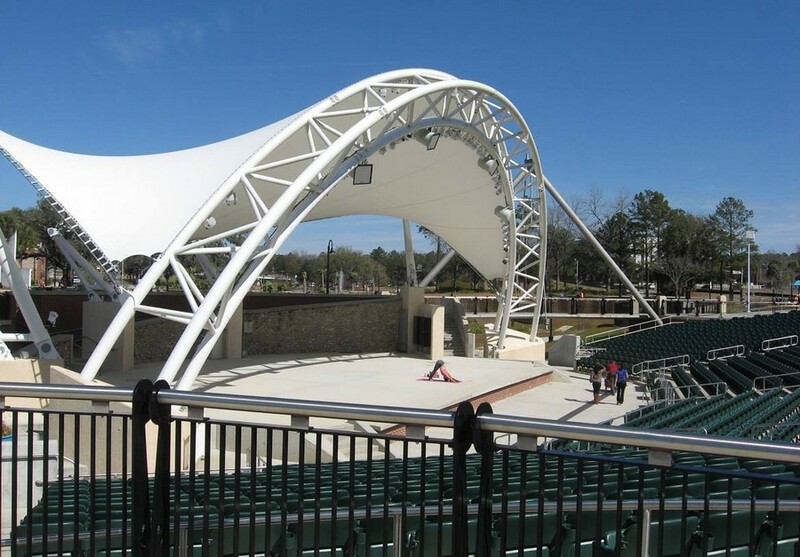 Sally graduated from the University of Florida in Gainesville. 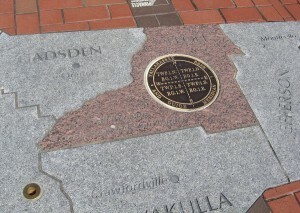 This is the Tallahassee Meridian. This survey monument serves as the principal meridian for all land surveys in the state of Florida. 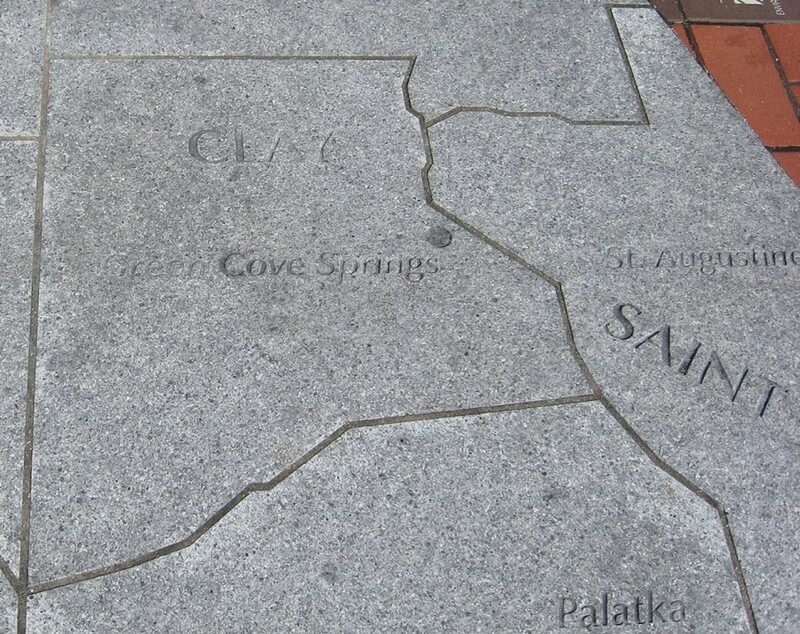 Green Cove Springs is the county seat of Clay County and it is my home town. 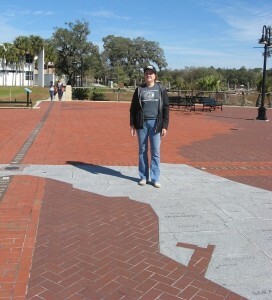 When I was young we lived on ten acres on the St. Johns River. These two compassionate ladies accepted our free KoreanDogs.org tote bags. 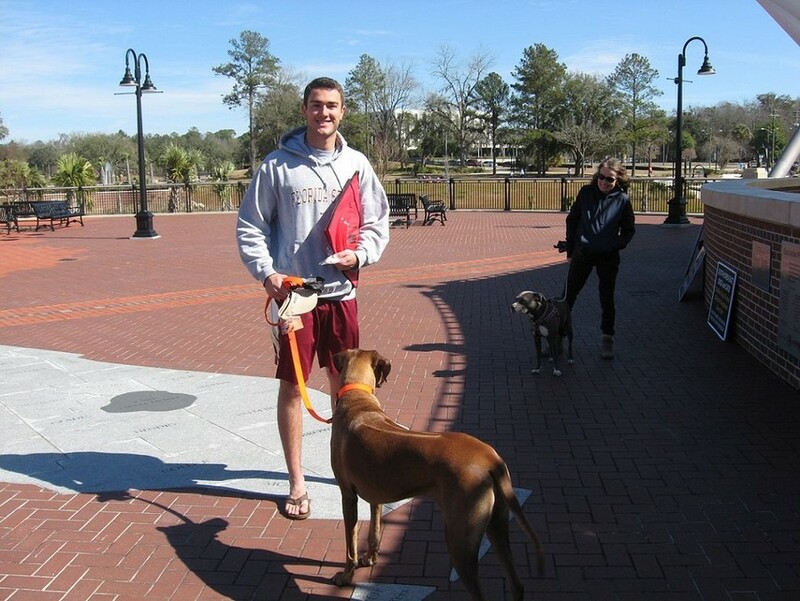 I think that this congenial student will be a good advocate as he wears a KoreanDogs.org hat and carries a KoreanDogs.org tote bag around the Florida State University campus. 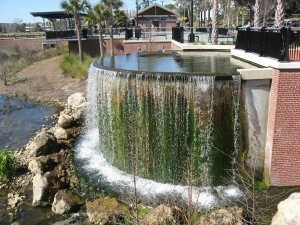 Cascades Park occupies 24 acres near the FSU campus. It’s also near the Florida A&M campus. 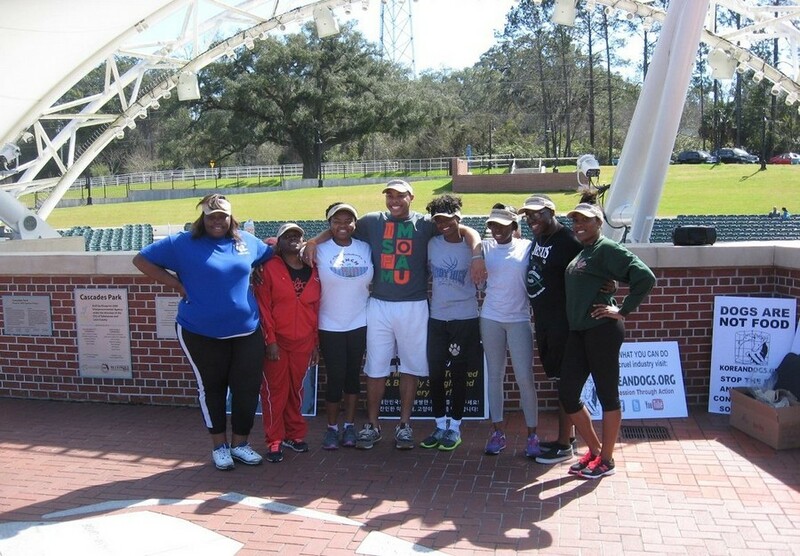 Olympic champion sprinter and great Dallas Cowboys receiver Bob Hayes is a FAMU graduate. Here is Sally telling these Jehovah’s Witness gentlemen about the horrific dog meat trade. They helpfully cited scriptures that prove that a benevolent God would not approve of animal cruelty. Sally played the piano in her church for twenty years. After lunch ,Sally and I gave away promotional items and passed out leaflets at the Arti-Gras Festival in downtown Tallahassee. 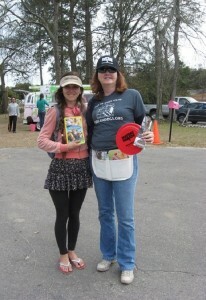 We met a wonderful young vegan named Anna who helped us there. We gave KoreanDogs.org visors to each member of this happy church group. 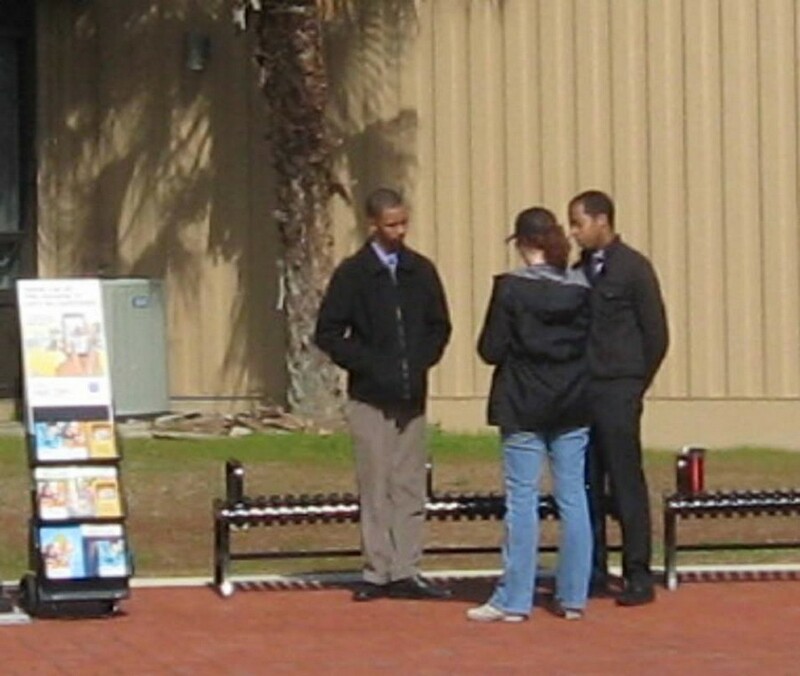 They were genuinely concerned about animal abuse. 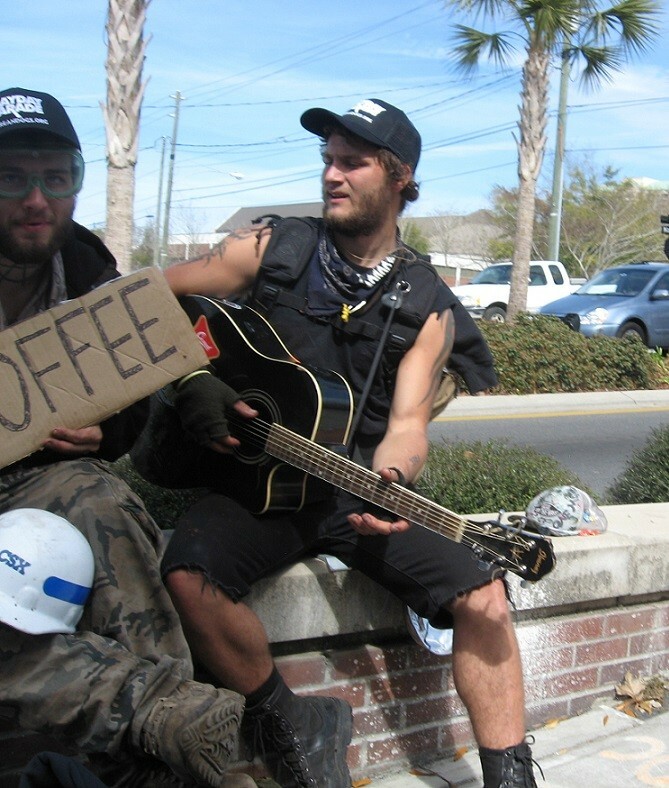 Sally and I encountered these two street people. That’s “Snack Pack” on the left and “Anger”. We gave them each a Mayday Parade/KoreanDogs hat. Sally and I ate lunch at Gaines Street Pies. 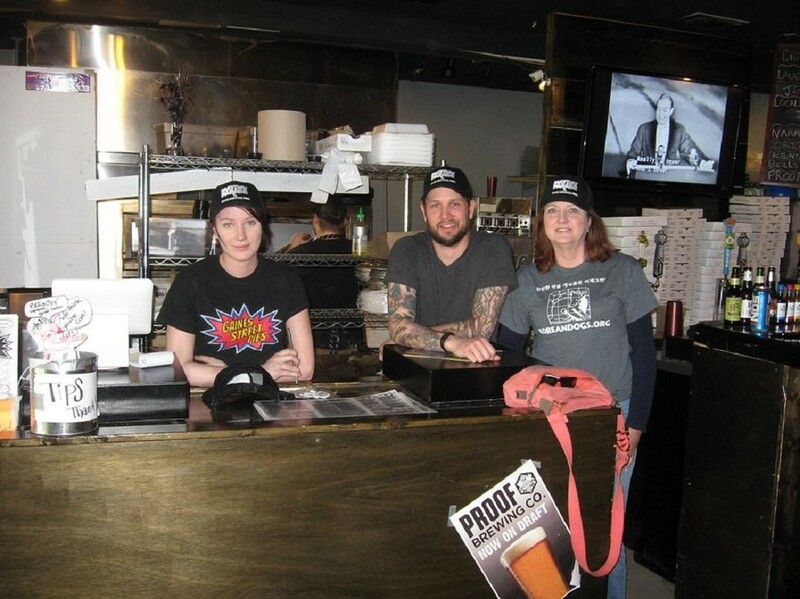 We had a vegan pizza named after her son Derek of the alternative rock group Mayday Parade. We gave hats to the staff and they allowed us to leave leaflets for KoreanDogs.org and veganism. 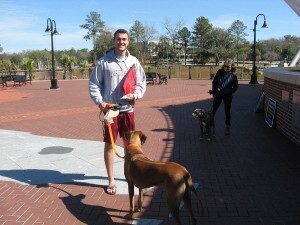 That’s Kate and Brandon with Sally. 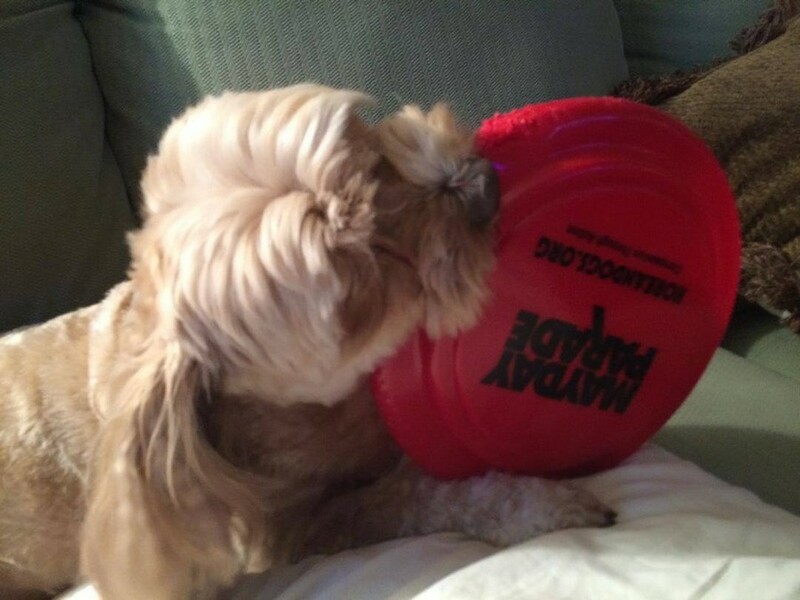 This is Summer with her favorite toy, a KD Frisbee. Sally gave it to her friend Melissa Farley who is Summer’s guardian. Summer brings the Frisbee to everyone and drops it in their laps. 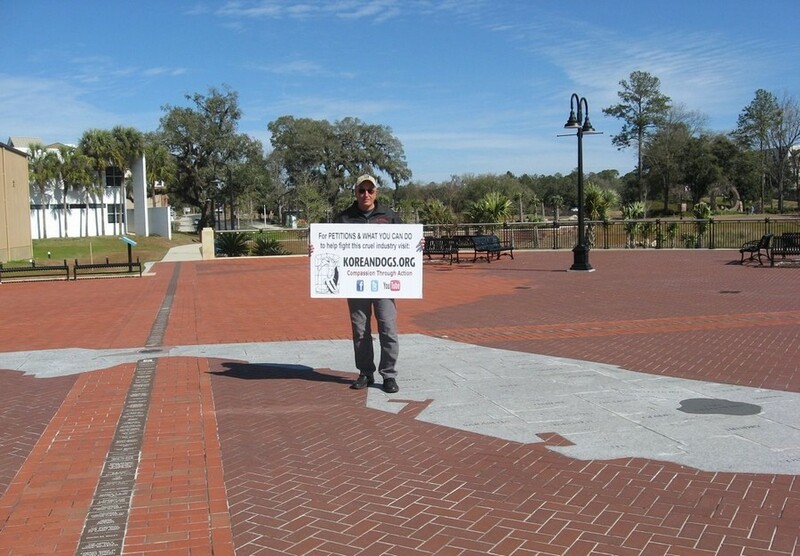 She is raising awareness on behalf of the dogs who are being tortured and eaten. WAY TO GO, SUMMER! Thank you, Bob, Becky, Pippa, and Sally for your compassion and dedication to speak out against the cruelty and injustice of the South Korean Dog and Cat Meat Trade!